I’m sure everyone is tired of seeing the ice bucket challenge videos by now, but I am so excited to see a marketing campaign go viral for medical research. I hope they are able to take all of this money and really make some great progress on eradicating such a terrible and debilitating disease. A game where you battle family members but you’re the clumsiest person ever. We quickly got to work on brainstorming and decided that we would make a game where you play a red headed step child who could only control his arm by swinging it like a pendulum. Within a few hours we had a very basic project in Unity and art and music were in production. I was really impressed by everyone on the team. They were all sharp, focused, and passionate about game development. Most of the them were still in college, some had recently graduated, and I was the old man on the team having been out of college for nearly a decade. I learned that this is a great place to scout out talent if I ever need to hire somebody in the future! It’s time to unveil what we’ve been working on for the past few months. They say don’t reinvent the wheel. But sometimes, you just need to know: will it roll? I am frequently asked what I use to write my games, so I thought it was time to just write it down and put it in one place. 95% of my code is in C++, and then I have a different application layer for each platform. 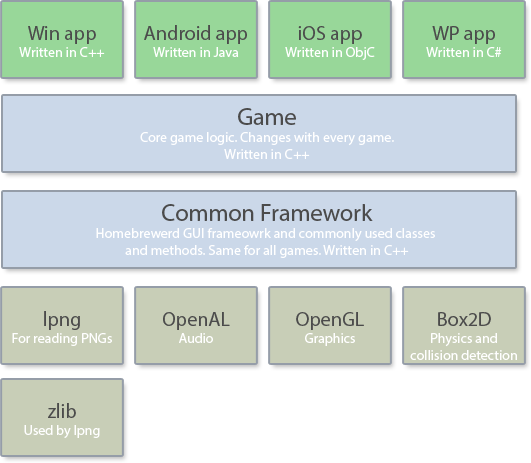 Windows is C++, Android is Java, iOS is Obj-C, and Windows Phone is C#. I do nearly all of my coding in Visual Studio 2012 on a Windows 8 machine. It’s my favorite IDE by far, and is also my favorite product from Microsoft. C# is my language of choice, but C++ is a great since it runs everywhere. This is changing now that Unity3D is becoming so popular. I have started to tinker with it and I’m really excited that it uses C# for scripting. It is possible that my entire workflow may change for my next project, but that’s to be expected sooner or later. Artwork is done in Photoshop, though most art is done by my friend, Matt Clair. Sprites are packed into a a texture atlas using TexturePacker. I use Audacity for any audio work, but I typically buy stock sounds from soundsnap.com. I have yet to put music into any of my games. It seems that every time I release a new game, my players manage to do the impossible. SimpleRockets has been no different. Within just days after release, I am seeing high scores that I never thought would be possible, and I’m seeing picture albums detailing long, complex, and well thought out missions that players are creating by themselves in the Sandbox mode. Banjerpickin managed to get a rover all the way to Smoon and land it safely. He even built a skycrane to safely get the rover down to the surface. Really impressive! You can see the full album here, and you can see the discussion on reddit here. Nut007 managed to build a rocket to get himself all the way from Smearth to Smenus. If you have a question about the game, or want to see more of this stuff, please visit the SimpleRockets subreddit. My newest game, SimpleRockets, was released yesterday (9/5) and rose to the #2 spot in the iOS App Store. Needless to say, it’s been an exciting day and I thought it would be fun to share the details of my marketing campaign. Let me first state that the overnight success of SimpleRockets really started three years ago. Thanks goes to the CEO of FreeAppADay.com, Joe Bayen. Today would not have happened if you had not reached out to me 3 years ago and took a chance on BridgeBasher. I would have never been able to get the user-base that I needed without that promotion. Thanks, Joe. I had a four pronged marketing strategy with SimpleRockets. I have four other apps on the market right now. They are still doing fairly well and have a fairly large user base. I added a link in each of my games that the player can’t miss that points them to SimpleRockets. On launch day, I will release the updates and existing players will get a notification of the update. Hopefully they will hop in the game for a minute to check out what’s new and see the link to the new game. I also setup campaigns with FreeAppADay, AppGratis, and 3 Magic Shots to turn my apps to free for a few days. My app is then promoted on their websites. 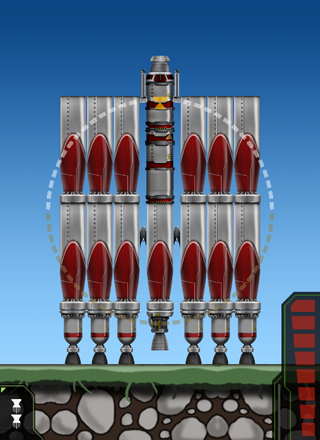 I hope to pull a lot of new players into my existing games so they can see the link to SimpleRockets. Every time I use my email mailing list, I feel like it becomes less effective and it’s expensive. However, the list has grown to 110k people, so I can’t ignore it. I setup an email campaign with Campaign Monitor. I only really used Reddit and Facebook. I didn’t have much hope for these services, but reddit has really blown me away. Facebook is okay, and a great way to tell my existing players that I have a new game out, but not a good way to get new players to try my game. Released all app updates – iTunesConnect was giving me a lot of grief. Lots of time outs and other issues. Trying to set SimplePhysics to free for the AppGratis promotion. It was a trying process. Kept getting timeouts from iTC and it kept logging me out. Extremely frustrating. Finally got it set to free. Trying to edit the app description and add the tagline for AppGratis. Timeouts galore. Argghh! Great! iTunesConnect just went to down for scheduled maintenance. I wasn’t aware they “scheduled maintenance” right in the middle of a business day. That’s outstanding. Really nervous that I can’t get into iTC to change my apps to free and add the taglines. I’m afraid the services are going to drop my campaigns – though I’m not sure what they’d do because iTC is down, so nobody on the planet can set their app to free right now. I noticed that SimpleRockets busted onto the iOS charts – popped in at #192 top overall. That is exciting. I haven’t even started the major promotions yet – those won’t start until tomorrow. I noticed that one of my app updates have gone through (SimplePhysics), but the other 3 have not. These are important, because they have links to SimpleRockets and I need them to go through well in advance of doing a free promotion so that new players will get the updated version with the link. Called iTC support and asked if they had more information about the outage. They said they didn’t know, just that people were working on it. Very friendly, but nothing they could do. They did offer to check on the app updates and minutes after I got off the phone I noticed the app updates had been pushed through. That was a relief. Going to bed. Checking the app store one last time. Wow! SimpleRockets is now at #45 top overall. Might be hard to sleep now after seeing that. Woke up because Charlie, my doberman, was acting strange. She just had surgery a few days ago to remove a corncob from her bowels. Be careful everyone. Corncobs are not for dogs! Checked my phone. WOW, #25 top overall. I lay back in bed staring at the ceiling, my mind is racing, heart is pounding…roll over and check iTC – it’s back up! Okay, might as well get out of bed and get started. Changed all of my remaining apps to free and put the taglines in. I’m not messing around with iTC today. I’m supposed to wait until afternoon to switch the FreeAppADay apps to free, but I’m afraid iTC might go down again. Not taking that chance. Wow, up to the 19th top overall app now. Check Youtube, find that Scott Manley’s channel has released a video review of SimpleRockets. Scott Manley is an extremely popular figure in the rocket science game genre. He could pull in a lot of new players, or repel them. I’m so nervous. I’m actually soaking my shirt with sweat as I click play. What if he doesn’t like it? What if he recommends players don’t buy it? Relief gradually washes over me as I watch a favorable review of the game. I even LOL at a few places. That’s great, I’m so happy, things are going about as good as they can. Kids are up, time to get them ready for daycare. Back from dropping the kids off at daycare. I’m trying to get a post going on reddit in the Kerbal Space Program subreddit. I know these guys would love my game. I’m painstakingly writing each person individually who commented on a reddit post I had made a few weeks ago with the trailer for SimpleRockets. This turns out to be around 30 people. 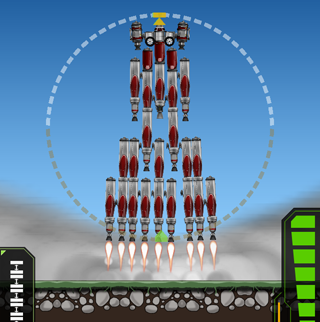 I just send them a link to the new reddit post, and hope that they will give me a few upvotes here and there and get the post rising in the KSP subreddit. Updating Facebook fan page now with a link. Throw in a nice screenshot – picture posts always seem to do better on Facebook. Keep coming back to reddit to check on the post and it’s rising. I’m talking with people who have feedback or questions about the game. I answer all questions like I have an aggressive case of OCD. I throw a few more posts up on reddit in the /r/iPhone and /r/Android subreddits. I doubt those will take off, but why not try. I finish up the email campaign I have set up with Campaign Monitor. I review it again and again, looking for anything I may have missed. Double-Triple-Quadruple check the links to make sure they are pointing to the correct app stores. Looks good. Send it. A/B campaign comes back and says that they are about equal. I manually select the B campaign and then blast out the remaining 108k emails. Out-of-office replies flood my inbox. Go through one-by-one. Sometimes you get some pretty funny ones. Getting tons of responses from people through email. People are being super nice and saying they are excited to try it and “buying it now” sort of stuff. Really uplifting! I check the AppGratis website and I notice that SimplePhysics is not up. This could be bad. SimplePhysics is an integral part of my promotion. Ideally it should be high in the free charts, pulling in players and then giving them a link where they can download the new app. What’s up AppGratis? Did you drop me from the promotion without telling me? I email them. Just puttering around now, responding to emails and reddit posts. Went to the Touch Arcade forums to throw up a forum post. Funny, somebody already posted on TouchArcade for me. That’s a good sign! Not getting as many email replies as I thought I would. I wonder what the issue is. Maybe it got caught up in spam filters? Up to #14 in the ranks now, that’s great! It’s still climbing the charts! At Midas now. Answering questions on reddit while I wait for my car to get serviced – the damn A/C is going out on it. People are still really enjoying the game. Mostly positive feedback. Starting to get some suggestions and minor complaints. What! #5 in the app store now? What happened last I checked it was 14, how did it jump a full 9 spots!? I am filled with glee. I immediately screen cap and send a text to my wife. I check the AppGratis website. SimplePhysics is still not up. Still no response from the email I sent them earlier. I email them again. She pauses. I glance over and see her thinking about how she’s going to explain this concept to a four year old. That really was a special moment, and for a second I couldn’t even hear my two year old daughter screaming that she wanted her sippy cup RIGHT NOW. AppGratis never did run the promotion for SimplePhysics. They never told me they were dropping it. They became incommunicado at the most crucial time for my campaign. Even despite that, SimpleRockets rose to the #2 spot overnight where it’s been sitting all morning. This is my best app launch, and I am very surprised the game did this well. I’m sure it will start dropping off the charts in a day or two, just like SimplePhysics did a few years ago. Until it does, the sales reports for the next few days will be silly. That’s exciting, not directly because of the money, but the freedom that money can buy to allow me to continue working on games, and not have to return to being a corporate software developer just yet. SimpleRockets rose from #192 to #2 yesterday, and received 13,178 downloads on iOS and about 4,465 downloads on Google Play. The other markets were negligible in comparison. 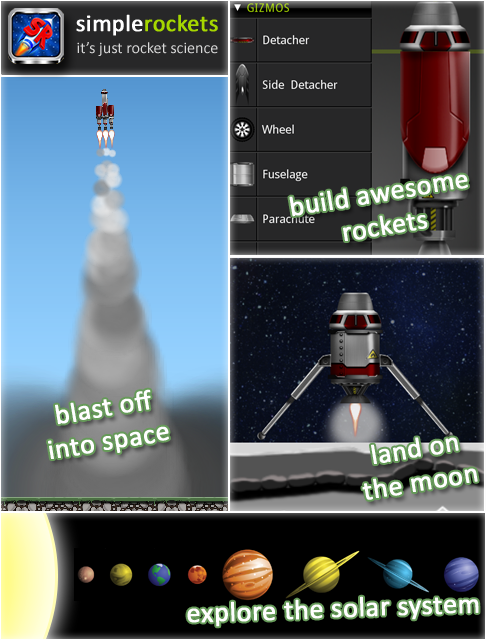 SimpleRockets is now available on iPhone/iPad, Google Play, Amazon App Store, Windows Phone 8, and PC. It’s just $0.99 on everything except for PC. Be sure to get it now, because the price will increase after this weekend! It’s always exciting to launch a new game, and I’m already seeing some very positive feedback from players. Great physics, many combinations, this game is one of the best iPhone physics games I’ve played! It’s a lot of fun just building rockets. The various challenges make it even more fun. I’d pay a lot more than $0.99 for this game. Great little orbit game. It’s like KSP lite, and a wonderful game in its own right! Well worth the purchase. I had the pleasure of meeting Laura Foy in Seattle for an interview on my experience porting my games over to Windows Phone 8.